Quitting Smoking is The Most Important thing you can do to improve your health. If you have COPD it is very important that you stop smoking to avoid additional damage to your lungs. You should also avoid ‘passive smoking’ as this is also a health risk to you. No matter how long you have been smoking, there are still great health benefits in giving up. If you continue to smoke after diagnosis with COPD, the damage to your lungs will get worse and your symptoms will get worse. Stopping smoking will improve your cough and phlegm production. It will also slow down the rate at which your breathlessness will increase. You have to WANT to give up smoking and only YOU can do it. There is no ‘magic cure’. Use the help that is available to you. Make a date to stop and stick to it. Allow time to prepare to stop and pick a time when you’re not under stress. Health Reasons: remember times you have been unwell in hospital. Other Reasons: for example the cost of smoking. When you quit you need to keep these reasons at hand. They are what will help you through it and make you realise that it really is worth the effort. Make a date to quit smoking and stick to it. Pick a time when you are not under any extra stress or a time too close to holidays or family occasions. Allow time to prepare to quit. 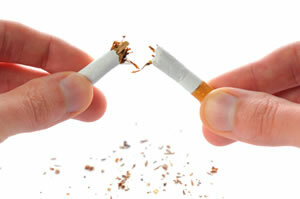 It has been proven that Nicotine Replacement therapy may assist you in quitting smoking. Patches, gum, lozenge and inhaler versions are all available in your local chemist. Medications are also available but MUST be prescribed from your GP. If you have a medical card you can avail of these for free if prescribed. Always seek advice from a health professional before using any of these products. Think about the times and situations when you smoke. Examples could be that you smoke first thing in the morning, when on the phone, watching TV, with tea/ coffee, alcohol with friends, when bored or stressed. The secret is to plan ahead, be realistic and be prepared. A strong craving lasts for 3 -5 minutes and then will pass. Delay for a few minutes and the urge will go away. Distract Yourself keep as busy as you can to stop you thinking of the cigarette. Drink water, juice, have a piece of fruit or a hard boiled sweet to replace the ‘hand to mouth’ habit of smoking. Breathe deeply, slowly breathing out to help you relax. Avoid substituting cigarettes with chocolate and crisps. Always have breakfast to kick-start your metabolism. Keep to your exercise plan recommended by your physiotherapist. You Can and Will Quit. Don’t focus on missing cigarettes, instead look at all the positives of becoming a non-smoker. €2,880 per annum. Treat yourself to something for every week you quit. Reward yourself! One of the great side effects of stopping smoking is the extra money and its good to have something to show for your efforts. The Irish Thoracic Society is a partner in the QUIT Campaign. Learn more.